“Yes, I knew this would be great!” That’s pretty the thought that ran through my mind throughout the entire episode. Right from the opening moments, I knew my expectations would be realized. In the first scene, we’re treated to a quaint, calming introduction to the countryside setting which ironically becomes the focus of the comedy for the episode. The series is set in what is essentially the middle of nowhere, where the school only has four students. We have the first-grader, Renge Miyauchi (CV: Kotori Koiwai), who’s the youngest of the group and the instigator of most of the comedic tangents. There’s also the 7th grader Natsumi Koshigaya (CV: Ayane Sakura) and her 8th grade sister, Komari (CV: Kana Asumi). Things change a bit when a transfer student arrives from Tokyo. His name’s Yuu Narukami. She’s an abnormally tall fifth grader named Hotaru Ichijou (CV: Rie Murakawa) who moved because of her parents’ jobs. That’s always how it is, but I can’t imagine what kind of job brings people to no man’s land. Oh yeah, there’s one male student in the class as well, who happens to be a 9th grader. However, outside of being obscured by desks, being mute, and serving as a visual punchline for one of the jokes, he doesn’t play any sort of significant role. I think that’s genius and hilarious. It’s this kind of subtle humor that I really love in anime. Perhaps the most unique thing about the character dynamic is the fact that they’re all very different ages, which reminds me a lot of Minami-ke. Of course, just that little fact isn’t enough to really make this anime shine. That comes from great humor and impressive visuals. 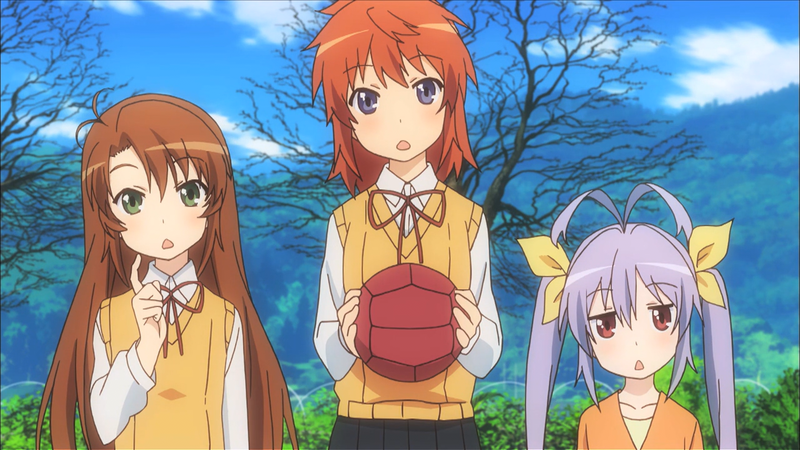 The kind of subtle comedy that’s used in Non Non Biyori is definitely hit-or-miss, depending on the viewer. If you’re like me, then you might appreciate how each scene is executed to incorporate small bits of humor, rather than bursting at your face with slapstick and one-liners. With each of these skits, we learn a bit about the characters and how they react to certain situations, thus causing gradual character development. However, you might find this style to be slow and uninteresting, so it all really depends on personal taste. The character designs are top-notch and the beautiful backgrounds are on the same level. Along with the meaningful camera pans around the scenery, we get an atmosphere that draws us into their world. 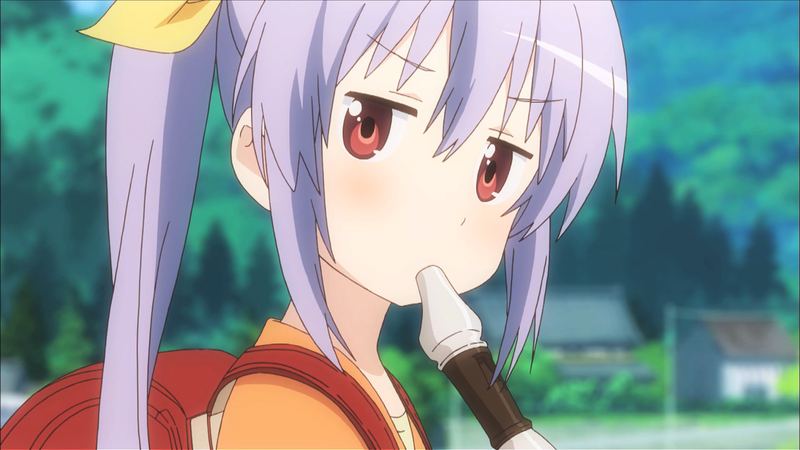 The music in Non Non Biyori is also superb, greeting us with soft pianos, playful recorders, wistful harmonicas, and pretty violins. Seriously, this type of setting would feeling quite at home under the name of Studio Ghibli. 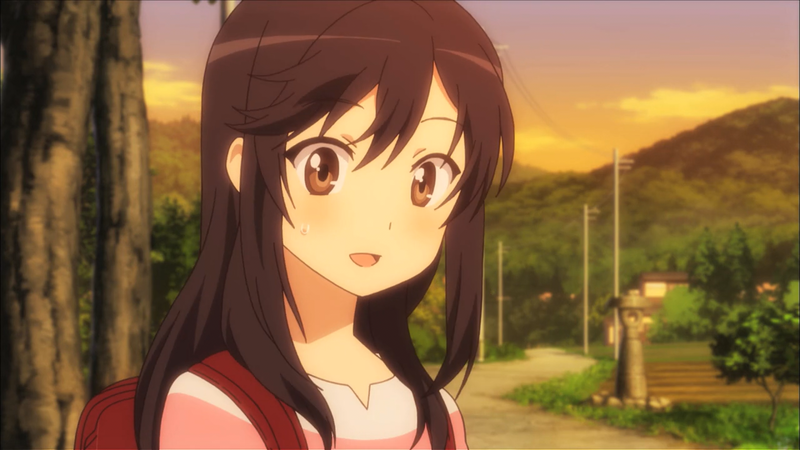 Non Non Biyori is the kind of show that you can relax while watching. The easy-going pace actually allows you to breathe deeply, while taking in the great atmosphere that it creates, and I’m sad that more series like this don’t air more often. People say they get sick of slice of life anime, but I think the setting alone of Non Non Biyori is enough to set it apart from the crowd. But unfortunately, I can see this getting overlooked very easily by everyone. So if you like slice of life at all, then you definitely need to give this a shot. You come for the warm atmosphere, and you stay for the funny characters. i love the music of this anime.. especially the recorder and piano .. violin also..
Yeah! The music helps to make a relaxing yet playful atmosphere.